As a 24 hour call center, we handle a wide spectrum of calls through out the day. When providing customer service, you are bound to encounter a customer that is unhappy or even angry. Unfortunately, customer service and call center agents often bear the brunt of this frustration. Since these agents are the face of your brand, they need to be trained to handle these types of calls effectively. How agents deal with these callers impacts customer satisfaction. In other words, it may cost you customers if not handled well. But you can help your customer service team beat this challenge by making conflict resolution in your call center a focus, building conflict resolution into your agent training program, and providing strategies to handle it when it occurs. The goal is to teach agents to stay calm and courteous in the face of customer frustration and conflict, and to maintain high levels of customer service while doing so. That can be a challenge. The key to beating this challenge is for your agents not to take things personally. You want to address the issue earlier be for it escalates. But not taking things personally allows agents to focus on the cause of the caller’s frustration and to deal with the problems effectively. That helps eliminate the potential for a customer service nightmare. You probably have a script for handling routine customer service calls. And your agents follow this script when dealing with customers. But you may not have a script to follow for angry calls. Create one as soon as you can. Then, make sure agents know they need to follow it when talking with angry callers. Having a few bullet points or go-to phrases in your script agents can use in these situations will help agents provide a good customer experience, boosting customer satisfaction rates. Angry callers need to vent, so remind your agents to let callers talk. Doing so lets them express their feelings and then calm down. Once they’ve calmed down, your agent can ask some basic questions to get at the underlying cause of the customer’s frustration. Remind agents about tone of voice. It’s critical when talking with angry or frustrated callers. A measured voice helps callers calm down, and helps agents manage conflicts. Also, remind agents not to laugh or mock callers in any way and to use a soft tone to convey empathy. In addition to the right tone of voice, remind agents to stay neutral when taking with frustrated callers. They shouldn’t agree or disagree with them. Also, remind agents not to respond to angry comments. Instead, let them voice their frustration and anger. Agents need to stay focused on helping customers resolve issues. They can then interject with helpful redirection at the right time. The goal is to redirect the conversation back to critical issues and provide constructive solutions to their problems. Returning to the facts can help agents de-escalate angry conversations and guide callers in defining solutions to their problems. Use phrases like: “Let me make sure I understand your issue….” That keeps things between the lines. Plus, it keeps things from escalating and eventually getting out of hand. Regardless of what transpires in the conversation, never tell the caller “No.” That goes for all situations, whether you’re dealing with an angry caller that wants a refund or another product in return. “No” cuts off the line of communication. It may also anger the caller, instead of calming him or her down. Remind agents that staying positive is contagious. Their positivity will eventually wear on the caller and help the caller understand that you will resolve the issue will in due time. Staying also positive rebuffs the caller’s negativity. In addition to providing agents with a script, you should take advantage of technology to help agents handle customer calls effectively. 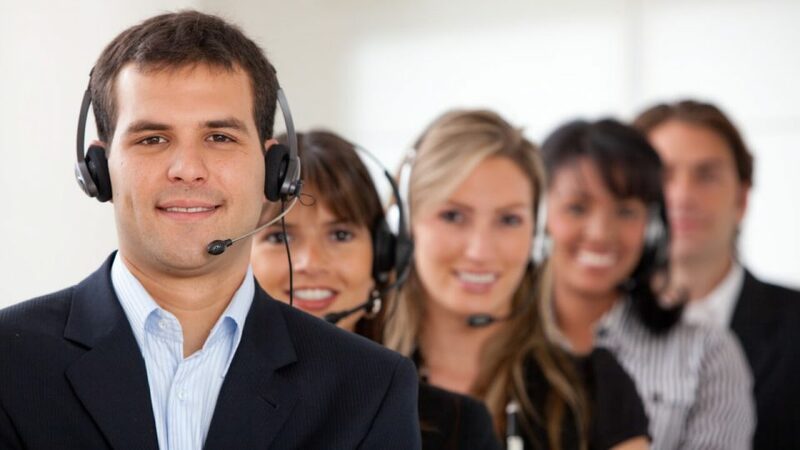 You can use call center software tools, like live monitoring and call recording, for example, to coach agents to use the right tone of voice with angry customers. The key is to teach agents to resolve conflicts in the early stage before they become a problem. Also, consider role-playing possible customer interactions. Team members can play the roles of angry customers to help team members learn how to deal with angry customers. Use real-life examples as part of your training dialogues.